Hello loves! 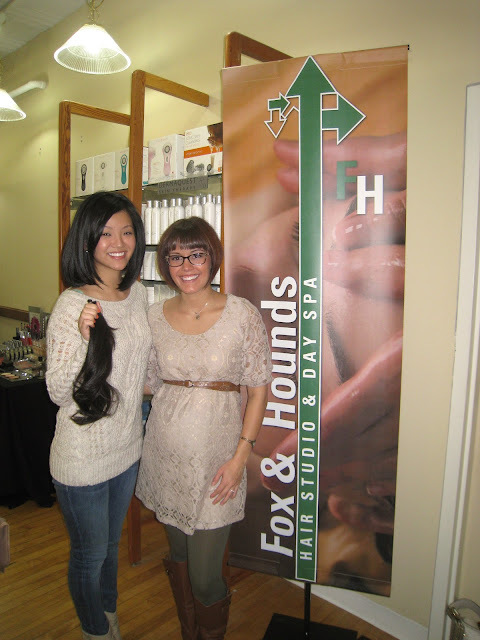 Yesterday was such a fun day for me, because I finally conjured up enough courage and confidence to donate my hair. Donating my hair has always been something I've wanted to do, but the thought of having short hair seemed horrifying. The last time I had shoulder length hair was freshman year in high school, and I remember absolutely hating it. Thus, I waited a decade to gamble with cutting it short again. In retrospect, I was young back then and didn't have the patience or skill to actually style my hair properly. Thankfully, I'm older now and don't care too much about vanity anymore, so I was ready to donate my hair for the first time in my life. I grew out my hair out for a little over a year and it got quite long (below). The length got so long that it was getting really difficult to style and manage. This may be TMI, but one day, I was looking at myself in the mirror and my hair was literally three inches from my booty. That, in itself, freaked me out so I called to make an appointment with my friend Katie before my hairs decided to get crazy on me. My friend, Katie, is a fantastic hair stylist artist, and she was the only person I trusted to make the cut. In the video (below), you can see that she sectioned my hair into 4 ponytails (2 short ponytails in the front & 2 long ponytails in the back) and cut the ponytails off that way to keep the length more even. The complete process took about an hour and a half (she scheduled extra time so we could chat too). I'm so grateful for Katie's delightful presence because it kept me calm and really let me enjoy the whole experience. I freaked out once, right before she cut the first ponytail, but after that, it was smooth sailing. It's a bit curled up, but a total of 14-15 inches when straightened out! My head feels so much lighter! Pantene’s minimum donation requirement is 8 inches of hair. Locks of Love’s minimum is 10 inches but will accept shorter pieces and sell them to offset the manufacturing costs of the hairpieces. Pantene’s wigs benefit women whose hair loss is attributed to cancer. Locks for Love’s wigs are sold to children under 21 with hair loss resulting from any array of factors. Pantene does not charge for the wigs, no matter what the recipient’s economic status. Locks of Love does not provide all of its hairpieces for free. According to its website, prices for human-hair wigs are set on a sliding scale based on the recipient’s family income. For more info, please visit their respective websites! In the end, I decided to donate my precious locks to Beautiful Lengths, because while I understand the desire to offset costs, I am not comfortable with the potential selling of my hair. I wanted to donate my hair to a completely non-profit organization and it seems that Beautiful Lengths was a better fit for me. I had a wonderful first experience with hair donating and I highly recommend it. It felt great knowing that I had the ability and opportunity to make a significant donation without having to whip out my checkbook. Love the new hair cut. It really nice of you to donate your hair. You Rock!!! !